Der bekannte Schweizer Tenor Ernst Haefliger ist im Alter von 87 Jahren gestorben. Er erlag am Samstag in Davos einem akuten Herzversagen, wie die Pressebeauftragte des Lucerne Festivals am Sonntag auf Anfrage bekannt gab. (ap) Haefliger wurde am 6. Juli 1919 in Davos geboren. Er studierte in Zürich Gesang und Geige und war einer der legendären Oratorien- und Liedsänger des 20. Jahrhunderts. Seine Interpretationen des Evangelisten in den Bach Passionen, besonders in den denkwürdigen Aufführungen des Münchner Bachchors unter Karl Richter, gelten als exemplarisch, wie es in der Würdigung des Lucerne Festivals weiter heisst. Als Opernsänger war Haefliger von 1943 bis 1952 als Ensemblemitglied am Opernhaus Zürich, in den Jahren 1952 bis 1972 als erster lyrischer Tenor an der Deutschen Oper Berlin tätig. Dort sang er sowohl alle Mozart-Partien als auch den Hans in Smetanas «Verkaufte Braut». Unvergesslich bleibe er als Pfitzners «Palestrina», schreibt das Lucerne Festival. Unter der Leitung von Ferenc Friczay spielte Haefliger bei der Deutsche Grammophon zahlreiche Mozart-Opern und Beethovens «Fidelio» ein, unter Leitung von Bruno Walter Mahlers «Das Lied von der Erde» bei Columbia Records. Seine Aufnahmen wurden vielfach ausgezeichnet. Haefliger hatte bei Leni Haefely, Julius Patzak und Fernando Carpi studiert. In Kritiken wurden sein unverwechselbar silbriges Timbre und sein aussergewöhnliches Gestaltungsvermögen gelobt. Von Beginn seiner Karriere an war Haefliger auch ständig Gast der grossen Festspiele wie Salzburg, Glyndebourne, Luzern. Haefliger war viele Jahre Professor für Gesang an der Musikhochschule in München. Nach seiner Emeritierung vermittelte er seine Belcanto-Technik vielen Studenten und verlieh 2006 dem Gesangswettbewerb «Concours Ernst Haefliger» seinen Namen, für den er auch als Juror wirkte. Ernst Haefliger, a Swiss tenor who was most renowned as an interpreter of German art song and oratorio roles, died on Saturday in Davos, Switzerland, where he maintained a second home. He was 87 and lived in Vienna. Charlotte Schroeder, his American manager, announced his death. Mr. Haefliger was a graceful singer with a flexible, lyrical voice that served him well in recitals — particularly in Schubert lieder — and made him an ideal Evangelist in Bach’s St. Matthew Passion and St. John Passion, or an eloquent Tamino in Mozart’s “Magic Flute.” His repertory included most of the Mozart tenor roles, as well the tenor roles in nonoperatic scores like Mahler’s “Lied von der Erde,” Bach’s Mass in B minor and the Beethoven Ninth Symphony. Ernst Haefliger was born in Davos on July 6, 1919, and studied at the Wettinger Seminary and the Zurich Conservatory before moving to Vienna, where he became a student of the tenor Julius Patzak. At first he focused on the recital and choral repertory, and in 1942, he made his public debut as the Evangelist in Bach’s St. John Passion, in Geneva. He also sang in the first performances of several works by the Swiss composer Frank Martin, including “Le Vin Herbé” in 1941, “In Terra Pax” in 1945, and “Golgotha” in 1949. At the urging of the conductor Ferenc Fricsay, with whom he went on to record several Mozart operas, as well as Beethoven’s “Fidelio,” Mr. Haefliger began studying opera as well, and joined the Zurich Opera in 1943. His first important operatic appearance outside Switzerland was as Tiresias in the premiere of Carl Orff’s “Oedipus,” at the Salzburg Festival in 1949. In 1952, he left the Zurich Opera and joined the Städische Oper (later the Deutsche Oper), in Berlin, where he remained one of the company’s principal lyric tenors until 1974. Mr. Haefliger made his debut at Glyndebourne in 1956, as Tamino, and at the Lyric Opera of Chicago, in the same role, in 1966. In the United States, however, he was heard mainly in recitals and in the Bach Passions. In recent years, he appeared as the Speaker in Schoenberg’s “Gurrelieder” with James Levine and the Met Orchestra at Carnegie Hall in 2001; he sang the Schubert song cycle “Die Winterreise” in a recital at the Metropolitan Museum of Art with his son the pianist Andreas Haefliger in 1995. Mr. Haefliger taught for many years at the Munich Hochschule für Musik and published a book, “Die Singstimme” (“The Singing Voice”), in 1983. In 2006, the Ernst Haefliger Competition was established in his honor in Switzerland. In addition to his son Andreas, Mr. Haefliger is survived by his wife of 53 years, Anna Golin Haefliger; another son, Michael Haefliger, who is the artistic and executive director of the Lucerne Festival; and a daughter, Christine Marecek. Ray Evans, whose long collaboration with songwriting partner Jay Livingston produced a string of hits that included the Oscar-winning "Buttons and Bows," "Mona Lisa" and "Whatever Will Be, Will Be (Que Sera, Sera)," has died. He was 92. Evans, who teamed with Livingston in the late 1930s, died Thursday evening at UCLA Medical Center of an apparent heart attack, Frederick Nicholas, Evans' lawyer and the trustee of his estate, said Friday. Considered among Hollywood's greatest songwriters, Livingston and Evans wrote songs for dozens of movies, most of them at Paramount, where they were under contract from 1945 to 1955. With Livingston providing the melodies and Evans writing the lyrics, the team turned out 26 songs that reportedly sold more than 1 million copies each. "Ray Evans, along with his late partner, Jay Livingston, gave us some of the most enduring songs in the Great American Songbook," lyricist Alan Bergman told The Times on Friday. "We will miss him but know that his songs will live on." In addition to their three Oscar winners, Livingston and Evans earned Academy Award nominations for "The Cat and the Canary," from "Why Girls Leave Home" (1945); "Tammy," sung by Debbie Reynolds in "Tammy and the Bachelor" (1957); "Almost in Your Arms," from "Houseboat" (1958); and "Dear Heart," from the movie of the same name (1964). "Dear Heart," with lyrics credited to Livingston and Evans and music by Henry Mancini, became a big hit for Andy Williams. "I just loved the record I made of 'Dear Heart,' " Williams told The Times on Friday. "Livingston and Evans were really part of the generation of songwriters that I loved, and I sang a lot of their songs over the years. I wasn't as close to them like I was to Johnny Mercer and Henry Mancini, but I certainly recognized their talent and how good they were at their craft of putting out great songs." Among Livingston and Evans' songs, which have reportedly sold a total of nearly 500 million copies, is the Christmas standard "Silver Bells." Introduced in the 1951 Bob Hope-Marilyn Maxwell comedy "The Lemon Drop Kid," "Silver Bells" is said to have been recorded by nearly 150 artists and have sold more than 160 million copies. The duo also wrote the memorable themes for the television series "Bonanza" and "Mr. Ed." "Ray had a great ear for language, for the vernacular, which is something he had in common with many of the great lyricists," singer-pianist Michael Feinstein, who in 2002 released an album devoted to the Evans and Livingston songbook, told The Times a few years ago. "He was able to distill a mood or a feeling into a song without it sounding cliched," Feinstein said. "He did not consider himself a sophisticated writer, but he knew how to express the thoughts, feelings and emotions of the common man in an eloquent way." The son of a second-hand paper, string and burlap dealer, Evans was born in Salamanca, N.Y., south of Buffalo, on Feb. 4, 1915. After graduating from high school, where he played clarinet in the band and was valedictorian, Evans earned a degree in economics from the Wharton School of the University of Pennsylvania. While at the university, he met Livingston, a journalism major from Pennsylvania who had studied piano as a child. Evans joined Livingston's band, which performed at college dances and parties, and during school vacations they played together in cruise ship bands. After graduating in 1937, Evans and Livingston continued to work on cruise ships before moving to New York City, where they began their songwriting collaboration. They had their first success in 1941, when their song "G'Bye Now" was incorporated into John "Ole" Olsen and Chic Johnson's zany Broadway revue "Hellzapoppin' " and landed on "Your Hit Parade." In 1944, the two songwriters came to Hollywood, where they had a hit with Betty Hutton's recording of "Stuff Like That There." They earned their first Oscar nomination with "The Cat and the Canary." Under contract to Paramount, the pair wrote one of the biggest hits of 1946: the title song for the Olivia de Havilland movie "To Each His Own," the basic framework of which began with Evans' phrase "two lips must insist on two more to be kissed." For one week in 1946, five versions of "To Each His Own" were on Billboard's Top 10 list, with recordings by Eddy Howard (No. 1), Tony Martin, Freddy Martin, the Modernaires and the Ink Spots. Livingston and Evans picked up their first Oscar for the bouncy "Buttons and Bows," which was introduced by Bob Hope in the 1948 comedy western "The Paleface" and recorded by Dinah Shore, among others. While at Paramount, the songwriters even made a cameo appearance playing themselves in Billy Wilder's 1950 classic "Sunset Boulevard." Although they were born only six weeks apart, Livingston and Evans were "not the least bit alike," Evans told The Times in 1985. "I'm nuts about sports, play baseball and tennis every weekend; Jay couldn't care less. He's restrained and quiet; I'm more outward going. Jay is a marvelous musician; I have a tin ear." But, he said, "our tastes are similar, and we both like good music and song." "Mona Lisa," which they wrote for "Captain Carey, U.S.A.," a 1950 drama starring Alan Ladd, remained Evans' favorite song. It was originally called "Prima Donna," but they changed the title at the suggestion of Evans' wife, Wyn, who thought "Mona Lisa" sounded much nicer. In the movie, the song is sung by a blind Italian street singer to send a signal to Italian partisans during World War II and is heard only in fragments. But Evans and Livingston thought that if they could play the song for Nat King Cole, they might be able to persuade him to record it. "So Paramount Studio, who owned the song, pulled some strings, and [Cole] allowed us to come to his home and play it for him, in 1950," Evans recalled in a 1993 interview with the Buffalo News. "He recorded it, and in 1951 Capitol Records decided not to release it. They said it wouldn't ever be a hit." Capitol eventually used the song, but only as the flip side of a Cole single the record company felt would become a hit, "The Greatest Inventor of Them All." 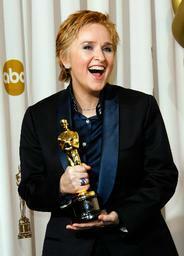 "Eventually, we had the last laugh," Evans said. "Mona Lisa" became an enormous hit. "It was so different and so unusual," he said. "It's hardly ever dropped in popularity … and it's given me a lot of credit and ego." After leaving Paramount to work as freelancers in 1955, Livingston and Evans won their third Oscar for "Whatever Will Be, Will Be (Que Sera, Sera)," which was sung by Doris Day in Alfred Hitchcock's 1956 thriller, "The Man Who Knew Too Much." The duo also wrote the music and lyrics for two Broadway musicals: "Oh Captain!" in 1958 (a Tony nominee for best musical) and "Let It Ride!" in 1961. And in 1979, two of their songs were included in the hit Broadway revue "Sugar Babies." In later years, they provided special material for Bob Hope and charity shows. In 1993, Evans returned to Salamanca, which renamed a Main Street theater in his honor. Then 78, he told the Buffalo News that he no longer wrote songs. Popular tastes had changed drastically since his and Livingston's heyday, he acknowledged. "There's no way we are going to be heard," he said. Still, there was no denying the staying power of their songs. The year before, Evans and Livingston and their publisher each made $400,000 off royalties from past hits. But although they no longer had the "economic pressure" to continue writing, he said, "you don't live on bread alone. There's the excitement and fun that you miss." After Livingston died in 2001 at the age of 86, Evans wrote a few songs with other collaborators. But, according to Feinstein, "he said it was a strange experience after being teamed with Jay for over 60 years." Evans, whose wife died in 2003, is survived by his sister, Doris Feinberg. Ray Evans, a pop lyricist who teamed up with the composer and lyricist Jay Livingston to write three Academy Award-winning songs and one of Nat King Cole’s best-known classics, as well as the Christmas standard “Silver Bells,” died on Thursday in Los Angeles. He was 92. Jim Steinblatt, a spokesman for the American Society of Composers, Authors and Publishers, announced the death. In their heyday, in the 1940s and ’50s, the team of Evans and Livingston was much in demand in Hollywood, turning out songs for film after film that often became big jukebox hits. The team was formed after Mr. Evans met Mr. Livingston at the University of Pennsylvania, survived separation during the war years and enjoyed decades of success until the emergence of rock ’n’ roll. Evans and Livingston received their first best- song Oscar for “Buttons and Bows,” a bouncy tune from the 1948 comedy-western “The Paleface.” It was introduced by Bob Hope, playing the timid dentist “Painless” Peter Potter, who sang it to Jane Russell. Dinah Shore had a hit record with it, and the song spent 19 weeks on the “Hit Parade” radio program. “Mona Lisa” was written in 1950 for a forgettable Alan Ladd film called “Captain Carey, U.S.A.” In the movie, the song is used to send a signal to Italian partisans during World War II. Originally, it was called “Prima Donna,” but Mr. Evans’s wife, Wyn, preferred “Mona Lisa.” The songwriting team agreed. It became one of Cole’s greatest and most enduring hits, and Mr. Evans was especially pleased when Natalie Cole revived it on a hit record of her own. “Que Sera, Sera (Whatever Will Be, Will Be”),” which won a third Oscar for the team, was sung by Doris Day in “The Man Who Knew Too Much”(1956), Alfred Hitchcock’s remake of his own1934 film. A little improbably, Ms. Day belts it out to signal to her kidnapped child that she and her husband (James Stewart) have come to the rescue. Ms. Day’s recording was a hit, and it, too, survived in other recordings and even a television commercial. Other Livingston-Evans movie songs were nominated for Oscars, among them “The Cat and the Canary,” from “Why Girls Leave Home” (1945); “Tammy,” from “Tammy and the Bachelor” (1957), which became a best-selling record for Debbie Reynolds; “Almost in Your Arms,” from “Houseboat” (1958); and “Dear Heart,” from the 1964 movie of the same name, starring Glenn Ford and Geraldine Page. Andy Williams had a hit with “Dear Heart,” singing the Livingston-Evans lyrics to music by Henry Mancini. Mr. Livingston and Mr. Evans also wrote the lyrics for a 1947 tune that Victor Young adapted from a Hungarian folk song to serve as the theme for the movie “Golden Earrings.” Sung in the movie by the basso Murvyn Vye, it became a hit record by Peggy Lee. “To Each His Own” was a big hit in 1946 for several performers: Eddy Howard, the Ink Spots, Tony Martin, Freddie Martin and the Modernaires.Perhaps the team’s biggest commercial success was a Christmas song they first called “Tinkle Bell” until Lynne Livingston, Jay’s wife, objected to the title. The song became “Silver Bells,” and it was first sung by Bob Hope in “The Lemon Drop Kid” (1951). “Silver Bells” is one of the most popular Christmas songs ever written, selling millions of records. Mr. Evans and Mr. Livingston were both small-town guys, Mr. Livingston from McDonald, Pa., and Mr. Evans from Salamanca, in the middle of a Seneca Indian reservation in western New York. Mr. Evans was born there on Feb. 4, 1915, the son of Philip Evans and Frances Lipsitz Evans. The elder Evans was a scrap dealer from Latvia. Neither parent was musical. While he was at the Wharton School of Business at the University of Pennsylvania, he met Mr. Livingston, who was studying journalism at the university and was the organizer of a dance band. Mr. Evans tried out for the band and made it, and the two became partners for more than 60 years. After graduation, they moved to New York to try their hand at Tin Pan Alley songwriting. They had a hit with “G‘Bye Now” in 1941, but World War II intervened, and Mr. Livingston was inducted into the Army. Mr. Evans took a bookkeeping job at an aircraft plant on Long Island. In 1944, they reunited and, after some work in New York, including writing special material for the comedy team of Olsen and Johnson, they attracted the attention of Johnny Mercer, who liked their work and opened doors for them in Hollywood. In the years that followed, they wrote 600 to 700 songs, of which 300 were published. They also contributed songs to more than 80 movies, including “My Favorite Brunette” (1947); “Whispering Smith” (1948); “Sorrowful Jones” (1949); ; “Fancy Pants” (1950); “Here Comes the Groom” (1951); “Aaron Slick From Punkin Crick” (1952); “That’s My Boy” (1951); ; “Lucy Gallant” (1955); “Istanbul” (1957); ; “The James Dean Story” (1957); “This Happy Feeling” (1958); ; and “Wait Until Dark” (1967). For some of these films they worked with the great names in movie music, like Percy Faith, Max Steiner, Neal Hefti, David Rose, Jimmy McHugh, Franz Waxman and Sammy Cahn. The team tried the theater without much success and found little demand in Hollywood for their kind of music once rock arrived. In later years the pair turned their attention to television and wrote the theme music for long-running series like “Bonanza” and “Mr. Ed.” Mr. Livingston died in 2001. Mr. Evans, who had no children and is survived by his sister, Doris Feinberg of Salamanca, was a self-deprecating fellow who liked to call himself a “sounding board” for his partner. 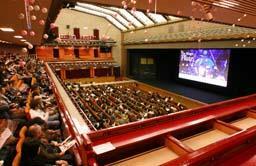 But he was much honored in Salamanca, which renamed its movie house the Ray Evans Seneca Theater. (Kyodo) _ North Korean leader Kim Jong Il invited prominent Japanese conductor Seiji Ozawa to conduct North Korea's national orchestra, but the 71-year-old maestro declined the offer, a South Korean newspaper reported Wednesday. Quoting a source in Japan, the JoongAng Ilbo reported the North Korean leader sent an official from the pro-Pyongyang General Association of Korean Residents in Japan to Ozawa to convey the invitation in May last year. "I was truly impressed by your conducting. I really want to have you as the conductor of Pyongyang National Symphony Orchestra," Kim was quoted as saying in the message. 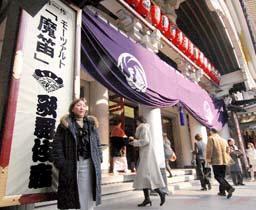 Ozawa declined the offer, saying his contract with Vienna Staatsoper will last until 2009, the report said. Ozawa was receiving medical treatment in Tokyo at that time. Kim then sent another invitation to Ozawa, saying the Japanese conductor could work in both orchestras. In around August last year, Ozawa also declined the second offer, saying, "I thought a lot and I don't think I can focus on music in the political environment in North Korea." The source said Kim issued the directive to invite Ozawa after being impressed by watching his performance by videotape early last year. North Korea took a break from its hit parade of rousing revolutionary songs yesterday to celebrate the work of Wolfgang Amadeus Mozart in Pyongyang. Kim Jong-il, the renegade leader known for his many eccentricities, ordered his nation to mark the 250th birthday of Mozart by staging a rendition of his most famous works. The celebration was in stark contrast to North Korea's normal diet of titles including Let's Support our Supreme Commander with Arms and Song of Coast Artillerymen. "A concert was given at the Moranbong Theatre to mark the 250th birth anniversary of Mozart," the state owned KCNA news agency said. advertisementIt added: "Put on the stage were the orchestra of The Marriage of Figaro piano concerto No 23 and other music pieces of Mozart, who composed dozens of operas and symphonies and many other instrumental music and vocal songs, contributing to the development of Western music in the second half of the 18th century. "The State Symphony Orchestra successfully presented the peculiar attraction and diverse emotion of music pieces of Mozart through exquisite rendition and truthful representation." North Korea's government has banned popular music from South Korea and the West as subversive and has a habit of jailing people who own records not to the liking of officials. But Kim is known to be an admirer of the Austrian composer and claims to boast similar talents. According to his official biography, Kim was also a musical prodigy, penning the song The Embrace of My Motherland at 10 and writing several revolutionary operas by his early 20s. His talents apparently do not stop there. Official state news carried reports that he bagged 11 holes-in-one while playing his first game of golf. Even before the Metropolitan Opera’s Saturday matinee of Mozart’s “Magic Flute” began, this family-friendly version of Julie Taymor’s 2004 production looked to be a huge success. Children were everywhere, a rare sight at the venerable institution. They were having pictures taken in front of the house, dashing up and down the stairs of the Grand Promenade and, before long, sitting up in their seats all over the auditorium. Peter Gelb, the Met’s new general manager, whose multifaceted outreach efforts have already become a model for opera companies everywhere, has rightly stated that the major impediment to making this art form accessible to children is that most operas are simply too long. So besides translating the text from German into English, the solution here was to cut the production, which normally lasts 3 hours 10 minutes, down to 100 minutes without an intermission. Actually the matinee clocked in at close to two hours, but few of the children seemed to mind. The audience was remarkably attentive and well behaved. Of course one strict Met protocol — if you leave the auditorium, you are not allowed re-entry until intermission — was wisely ditched for the day, so children could take restroom breaks. Shortening the score involved what must have been painstaking decisions. The overture and several entire arias and ensembles were cut. Other arias were abridged through some very deft trims. Otherwise the Met went all out. The cast was excellent, and James Levine conducted. The Papageno, Nathan Gunn, was certainly cute enough. This dynamic baritone exuded charm and cavorted about the stage like an acrobat. At one point he tried to flee danger by scurrying up the side of a huge plastic tube he was trapped in, only to slide back down, landing with the floppy-limbed aplomb of a Charlie Chaplin. He seemed the darling of every child in attendance (and the audience included Mr. Gunn’s five). The stupendous bass René Pape was Sarastro. A lovely, clear-voiced lyric soprano, Ying Huang, in her debut role at the Met, was an alluring Pamina. Matthew Polenzani brought his sweet tenor voice and wholesome appeal to Prince Tamino. The agile coloratura soprano Erika Miklosa was a vocally fearless and aptly chilling Queen of the Night. As the wicked Monostatos, the trim tenor Greg Fedderly was unrecognizable with his flabby, fake pot belly, which induced giggles every time he exposed it. I am on record as being no fan of Ms. Taymor’s production, which to me is a mishmash of imagery, so cluttered with puppets, flying objects and fire-breathing statues that it overwhelms Mozart’s music. But this show was not presented with me in mind. So let me offer the reactions of three young attendees. Amitav Mitra, my neighbor, who is 8, came as my guest. And Kira and Jonah Newmark, 9 and 7, the children of friends, were also glad to share their critiques afterwards. For Amitav, this was his first opera. Though Jonah had seen opera videos at home with his sister, he too was trying the real thing for the first time. Kira, a burgeoning opera buff, has attended, as she put it, “real three-hour operas,” most recently “The Barber of Seville” at the New York City Opera. Not surprisingly Ms. Taymor’s fanciful sets, costumes and puppets won raves from this trio of critics. But their most revealing comments were about the singing and the story. The singing “was loud,” Amitav said. Jonah added, “It was too loud.” Kira more or less agreed. I pressed them about this. Today, when children hear amplified music everywhere, often channeled right into their ears through headphones, how could unamplified singing seem too loud? So their reaction was not a complaint about excessive volume, but rather an attempt to explain the awesome impression made by Ms. Miklosa’s dazzlingly high vocal flights as the Queen of the Night, or Mr. Pape’s unearthly powerful bass voice, or the amassed chorus in the temple scenes. It takes a while for young opera neophytes to adjust to such mind-boggling voices, to realize that this strange, unamplified “loudness” is actually amazing. I think Mr. Levine, who conducted a glowing and elegant performance, would be pleased by Kira’s reaction. Mr. Levine made certain that some of the opera’s most somber episodes were included, like the long scene in which the confused Tamino is confronted by the austere Speaker (David Pittsinger), a stalwart member of Sarastro’s brotherhood, at the entrance to the temple. Like most fairy tales “The Magic Flute” is a mysterious story of good and evil. 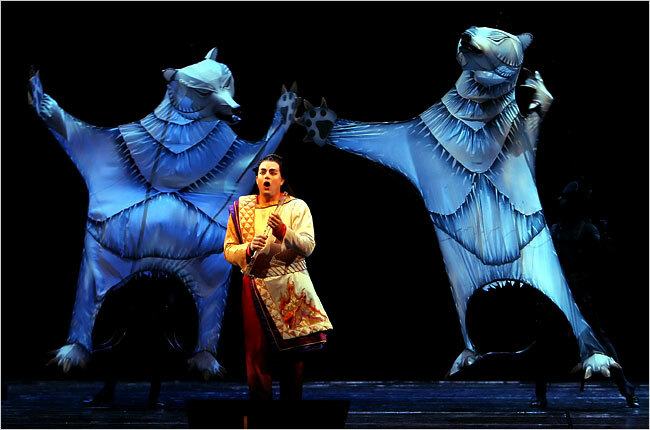 Naturally, Ms. Taymor’s production makes the opera’s monsters quite charming, like the puppet bears who are enchanted by Tamino’s magic flute. And the boys singing the kindly Three Spirits (Bennett Kosma, Jesse Burnside Murray and Jacob A. Wade) are turned spectral and eerie, with their bodies painted white and Methuselah beards. This “Magic Flute” was the first Met opera that was transmitted live in high-definition video to some 100 movie theaters around the world. Ultimately the point of this technological outreach is to entice newcomers into attending opera performances. The children I spoke with are likely to be back. 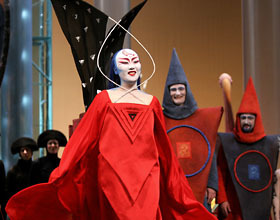 The shortened “Magic Flute” repeats today, tomorrow and Thursday at 1 p.m.; (212) 362-6000 or metopera.org. Performances are sold out, but returns may be available. NEW YORK -- Judging by the masses of smiling children who streamed out onto Lincoln Center Plaza after a family-friendly, shortened version of Mozart's "The Magic Flute," opera may have just gotten an influx of younger fans. Starting Friday, the Metropolitan Opera began presenting an English-language performance of "The Magic Flute," trimmed to about 100 minutes, aimed at attracting families. Saturday's performance was beamed from Lincoln Center in high-definition simulcast to about 100 movie theaters around the world. 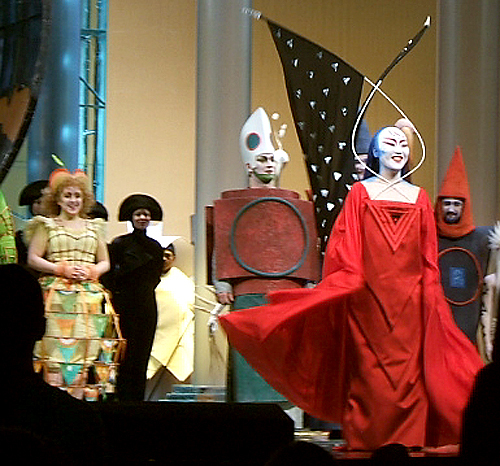 The debut of the cut-down version of Julie Taymor's colorful 2004 production was so popular it sold out. But for all its planning, the Met appeared to be somewhat unprepared for its shorter audience _ it ran out of booster seats in the orchestra 20 minutes before the start. Given the breadth of the simulcast venture, there was no way to judge the success. The Met said it was encouraged by sales, final figures won't be available for several days. The quality of picture and audio was high, although technical problems prevented the simulcast from being seen at theaters in Burbank, Calif., and Jacksonville, Fla.
To adapt and pare down "Die Zauberfloete," the German-language original that runs slightly more than 3 hours, including intermission, the Met hired poet J.D. McClatchy. His English version emphasizes rhyme, meter and fun over exact word-for-word translation. For Papageno's duet with Papagena, McClatchy rhymed "lovey" with "turtle-dovey." Purists may quibble with the many cuts _ which range from entire scenes to verses within arias _ but the full German version is being staged at night for those who want the complete production. Taymor said some cuts still were being debated in the final week, and the final version came in at about 105 minutes, 15 over the original projection. She and McClatchy kept true to their vow of not "dumbing down" the opera, which appeals to all age levels. With oversized bear puppets and dancing pink flamingos wowing the audience as much as the sublime music, Taymor's staging has been popular. Music director James Levine, who led his usual polished performance, had a top cast to conduct. Nathan Gunn, in Papageno's green bird suit, was a frenetic delight. Matthew Polenzani brought a bright tenor and dignity to Tamino, the prince who is destined to marry Pamina. Soprano Ying Huang gave an endearing account of Pamina, whose role is perhaps cut the most in the English version. Erika Miklosa, in her imposing headdress, easily tossed off the Queen of the Nights Fs _ her two arias weren't cut at all. Morris Robinson sang Sarastro on Friday, and the American bass sounded far more comfortable in the English version than he did in the German last season. Rene Pape sang Sarastro at the Met for the first time in Thursday night's German performance, then sang it in English on Saturday. He added a gravitas to the role, and while a German accent was evident, he brings a greatness to every role he performs. The family version was conceived in the final years of Joseph Volpe's run as Met general manager and Peter Gelb, who took over in August, said a new production of Humperdinck's "Hansel and Gretel" will be next season's holiday offering. While Gelb plans to rotate "The Magic Flute" and "Hansel and Gretel" as holiday offerings, he should consider broadening the project. Many children no doubt would love to hear cut-down English versions of other favorites, such as "The Barber of Seville" and "Carmen." On Saturday, Taymor and Gelb watched the high-definition simulcast from the Walter Reade Theater at Lincoln Center before hustling across the street during the final scene so Taymor could make it on stage for the curtain calls. There were some glitches at the start of the simulcast, with the timing of the subtitles slightly off, but the sharpness of the subtitles got better as the opera went on. The performances were the first English-language versions of Mozart's masterpiece staged by the company at the Met since 1977. Five additional operas are scheduled for Saturday afternoon simulcasts, with Bellini's "I Puritani" (Jan. 6) and Tan Dun's "The First Emperor" (Jan. 13) up next. In addition, there will be an encore of "The Magic Flute" in theaters on Jan. 23, a day before it is televised by PBS. 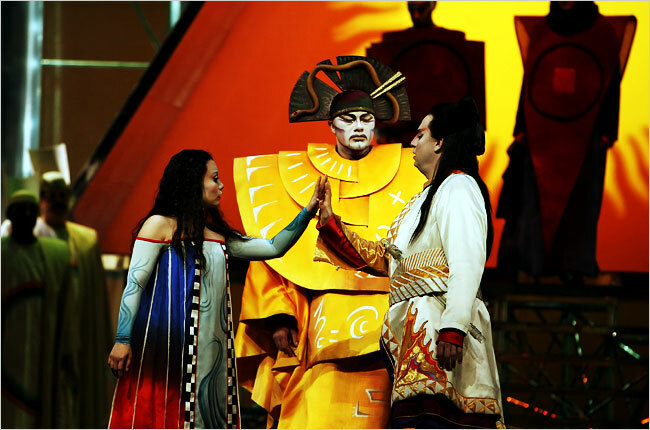 René Pape, center, as Sarastro, with Ying Huang as Pamina and Matthew Polenzani as Prince Tamino. 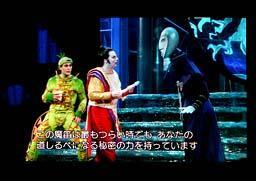 To introduce children to opera, “The Magic Flute” was cut to 100 minutes. In movie theaters across the United States on Saturday, people did an odd thing during the main attraction: They clapped. They clapped between scenes and when certain characters left the screen. But habits die hard. 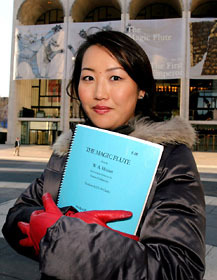 The show was a live broadcast, in high definition, of Mozart’s “Magic Flute” at the Metropolitan Opera, the first of six productions to be broadcast from the Met through April. “The Magic Flute” played at 100 theaters, most of them scattered throughout the United States and Canada, with seven in Britain, two in Japan and one in Norway. Though the box office receipts are not all in yet, the broadcasts seemed to be a success, with an average audience capacity of 90 percent, the Met’s press office said. Forty-eight of the 60 American theaters were sold out in advance, including those in Boston; Phoenix; Louisville, Ky.; Pittsburgh; and New Brunswick, N.J. Six of the 28 Canadian theaters were sold out, as were all of the locations showing it in Britain, as well as the theater in Norway. “This is a good opportunity to see opera without a lot of stress,” said Erika Homann, who was at a sold-out theater in Livonia, Mich., just outside Detroit, with her husband, their 8-year-old son, 5-year-old daughter and 11-year-old niece. Audiences tended to be middle-aged or older, though many parents, like Ms. Homann, brought young children. Several viewers said that they had attended productions by local opera companies but had never gone to the Met, which was a plane ride, hotel and $100-plus ticket away. These performances cost $18 a person. The broadcasts did not all go off without a hitch. A theater in Jacksonville, Fla., canceled the showing because of technical problems. Viewers in Lincolnshire, Ill., a suburb of Chicago, had to move at the last minute to another screen in the theater complex. The broadcast in Burbank, Calif., was plagued with stops and starts, sound problems and, at one point, a screen going completely blank. But though an usher offered refunds, most of the audience stayed to the end, making jokes whenever another glitch occurred and cheering during the curtain calls. There is a difference between seeing opera onstage and on screen, several attendees said. The camera chose the viewpoints and often closed in on a particular character rather than panning to show the whole scene. “One thing I wished I could have seen more of was how the sets worked,” said Martha Edwards, 63, who was at the theater in Lincolnshire. Some viewers even questioned why the Met hadn’t tried this already, praising the idea and lamenting the dwindling audience for opera. Few put it better than William T. Robinson III, a 66-year-old retired music teacher, at the theater in Huntsville. “If you go to many classical performances, you see that a lot of them are senior citizens, baldheaded and white,” said Mr. Robinson, who is black and was wearing a hat. “I think there is a need to create a new audience and get more minorities to come to these kind of activities. Nick Bunkley contributed reporting from Livonia, Mich.; Kyle Whitmire from Huntsville, Ala.; Libby Sander from Lincolnshire, Ill.; and Michael Parrish from Burbank, Calif.